A one-of-a-kind handbook filled with simple activity adaptations for people with developmental disabilities. 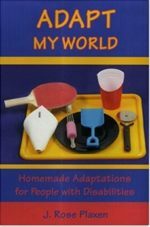 Whether for school or home, Adapt My World will help teachers, health professionals and parents enable and empower disabled children and adults to achieve simple goals that will fill everyone with pride and satisfaction. The unique layout makes Adapt My World an easy to follow reference source. Our Mission: To help improve quality of life for people through our trained therapy and assistance dogs. Fidos also educates the public about individuals with disabilities and about the benefits of assistance dogs and therapy dogs and the work that these specially trained dogs do for individuals with disabilities, children with reading difficulties, and patients in health care facilities. Independence Now is part of a nationwide network of Centers for Independent Living. We have the privilege to serve people with disabilities in Montgomery and Prince George’s Counties. We work diligently to make our programs the best they can be by constantly learning about resources, building relationships and going below the surface to insure consumers achieve their goals. The philosophy of consumer control is thick within the walls of Independence Now. We truly believe that people with disabilities are the best experts on their own needs and choices. Rock-Able will allow attendees to gain a better understanding of people with developmental disabilities using a real rock performance by LEFTSTRONGER and a presentation by lead singer & songwriter Jesse Magee. Address: 2003 Cricket Creek Ct.